Brolga congregate in huge flocks in the tropical north, but they penetrate as far as the south-east of South Australia in small numbers. Much of their earlier habitat has been drained and converted to cultivated pastures and cropland. Brolga have a widely varied diet. Major food items are the tuberous roots of sedges, but they also take insects, crustaceans, small vertebrates, and in cultivated areas, cereal grains and nut crops. They feed by digging with their large bill in drier areas, and foraging in shallow waters and wetlands. Breeding is in the wet season from July through to November. Their courtship involves an elaborate and courtly dance. The nest is a large mound, up to 1.5 metres in diameter, and built of grass and sedge stems. The normal clutch is two eggs. After the breeding season the family group joins with others into large flocks. Brolga (Antigone rubicunda Perry, 1810) is monotypic having no subspecies. 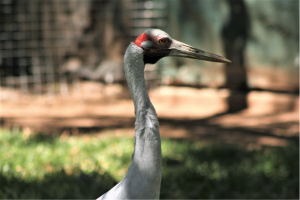 Brolga are large cranes with the male reaching a weight between 4.8 to 8.7 kg. Females are like males, but smaller (weight 3.6 to 7.3 kg). An overall light grey bird with duskier primaries. There is a characteristic bustle of elongated tertiaries and secondaries drooping over the tail. Most of the head and chin is bare of feathers and bright red except for a grey cap and a grey gap over the ear opening. The red does not extend down the throat like the similar Sarus Crane. The chin has a dusky-coloured dewlap, which is larger in the male. The iris is brown, the bill, legs and feet are yellow. Juveniles are like adults, but the head is entirely feathered, and the iris is brown. The chicks are grey with a buff head and neck. 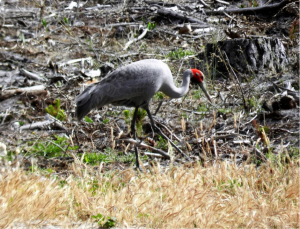 Generally, brolga like shallow freshwater marshes, but if these are not available, they will also use deeper marshes, wet meadows and brackish wetlands. Although they are non-migratory, in South Australia they will disperse to isolated wetlands in the breeding season, returning to traditional flocking sites in the dry season including permanent wetlands, upland pastures, irrigated fields, crops and stubble. Brolga are an uncommon species in the north-east and south-east of the state, are rare in the north west and along the River Murray. They may occasionally be found as a vagrant on the Yorke Peninsula, in the mid-north, the lower north east and on Kangaroo Island. They are officially rated as ‘Vulnerable’ in South Australia.